When the leaves begin to turn, the horse chestnut drops buckeyes to the ground. Remember as children, how we collected them and offered them to our moms, dads, and grandparents? Today’s buckeye gifts are even more splendid! 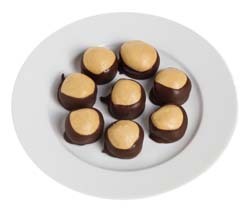 Dorothy’s hand-crafted peanut butter treats rolled in Swiss chocolates make any day of fall a celebration. Dorothy’s buck eyes make the perfect take-along for any fall celebration like Halloween and Thanksgiving. Hurry. We only make them for a short season each year.